The Syrian Democratic Forces Commander, Rojda Felat, confirmed that around 100 ISIS terrorists with YPG uniforms managed to infiltrate into Raqqa city on the 26th of September. She also added that these militants infiltrated “probably from government-controlled areas”. Although it is a possibility, it’s not the only one since most areas from east and central Syria are plain and mountainous desert, areas in which its very difficult to exercise real control, even from State authorities. IS terrorist could have infiltrated from SDF-held areas on the east bank of the Euphrates. Meanwhile, the SDF captured Imam Nawawi Mosque in Raqqa. Although SDF are at the brink of obliterating IS forces in Raqqa, the future of the city looks hard, at the best. Constant ISIS oppression and US-backed airstrikes leave a city -and its surrounding areas, almost empty of human activity, and a whole city in ruins. At the same time, the few civilians remaining in the city find themselves being used as human shields by its former ruler, the IS terrorist. Although, local-led Raqqa civil council has already begun to provide aid, relief rations and started working to restore some essential services. The Russian air force carried out multiple airstrikes targeting the Abu al Duhuhr airbase in the border between Aleppo and Idlib governorates. Government helicopters bombed Batanta village and the outskirts of MA’arrat Misrin, Yaqubiyah, and Bidama, among other places. There are several dead and injured civilians. Government forces shelled Al-Lataminah and Kafr Zita with heavy artillery located in Suran. Furthermore, SAA reestablished control over all the lost points to opposition forces in the last attack. Opposition forces announced they repelled a government attempt to infiltrate Zilaqiat. Apparently, the report opposition forces shot down a Russian helicopter with an ATGM was a hoax as no images or videos have been provided. Most of the Syrian government elite forces “Tiger Forces” are being moved to North Hama for an upcoming offensive on Khan Sheikoun. Government forces continued shelling and bombing Ayn Tarma and Jobar neighbourhoods with artillery, airstrikes, rockets and IRAM missiles. Other areas targeted by government forces include Harasta town and Douma village. Meanwhile, opposition groups destroyed two T-72 tanks and a bulldozer from the 4th Republican Guard Division at the Ayn Terma front. Furthermore, Faylaq Al-Rahman detonated a tunnel bomb under a government-held building, government forces casualties are unknown. More Red Crescent trucks loaded with humanitarian aid and basic need goods for civilians. The 36-40 trucks convoy made its way into government-held Deir ez-Zor where civilians are, little by little, going back to more normal life within the limits of a normal life in a civil war. 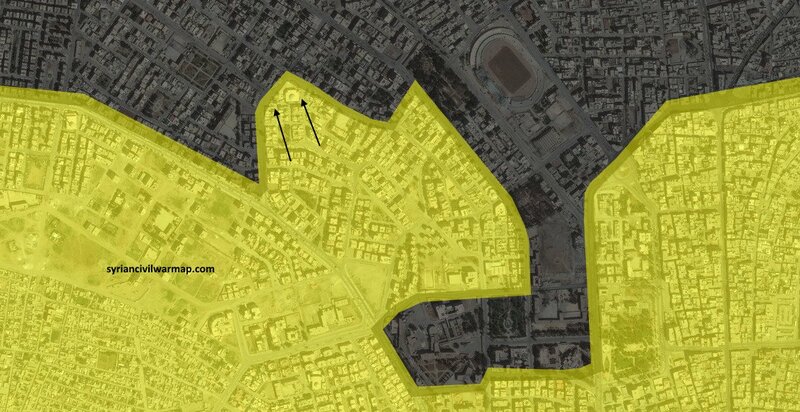 The SDF announced they captured 50% of Suwar town and is expected to be fully captured by its militants in the upcoming days. The SAA forces and allies destroyed an ISIS VBIED with an ATGM before it reached their positions near T2 in Homs-Deir ez-Zor area. On the 26th of September 2017, CJTF-OIR has conducted 37 strikes in Syria. CJTF-OIR‘s main focus in Syria is Raqqa region where they did 35 strikes supporting SDF‘s operations against IS destroying 26 fighting positions, four vehicles, four ISIS supply routes, a heavy machine gun and suppressed five ISIS tactical units. Other areas where two strikes occurred are Abu Kamal, Al Shadaddi and Deir ez-Zor destroying five vehicles. The full report on CJTF-OIR strikes conducted in both Syria & Iraq can be found here.